There was always a line of curious bystanders including women and children at a men’s urinal at Aspinwall House, the largest venue of the Kochi Muziris Biennale. Dia Mehta Bhupal’s life-sized construction had viewers peering closely at the public restroom meticulously built out of rolled up paper tubes, unused and on display. 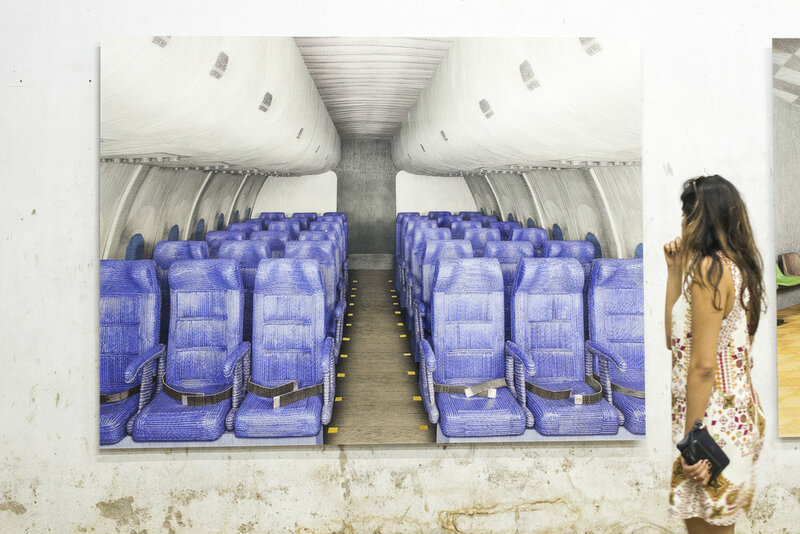 Dia is a photographer and at a second venue, Anand Warehouse, she displayed four photographic prints - a supermarket, a waiting room of a clinic, a bookstore and the inside of an airplane. Each is of one of her painstakingly constructed sets. The subjects are most often public, but the end result is quiet, her work centred around private moments in public spaces. We lunched with her to find out more. Take me to the beginning of your art practise. I graduated from Parsons with a BFA in photography. I used to photograph a lot of architecture and a lot of people, a lot of portraits. A lot of communities. When I first started my art practise, I did a lot of staged photography. I used to stage scenarios and photograph them, now I've moved on to constructing images. I think in a certain way, all images are staged because as a viewer, you always have your own narrative. You choose what you put into an image and what you leave out. Whether you frame it or pose things. Today I participate a lot more. I construct my own subjects and photograph them. When did you start making constructed images? What was the first thing u ever constructed? The bathroom was the first thing I ever constructed. It was the first work I ever did. I originally built the bathroom a few years ago but I collapsed it and stored it. I reassembled it for Kochi. It's the first time I've ever shown a set. Showing it at the main venue was the curator Sudarshan’s [Shetty] choice. How many have you created since the bathroom set? I'm currently working on my 9th set. Each construction takes me fourteen to twenty months depending on the availability of the colours and the magazines. Everything I use is found. Tell me more about the magazines. How do you create these sets? All my images are repurposed and created with waste paper, magazines, newspapers, old cardboard boxes, etc. Close inspection of the image reveals the intricate detail. Each colour is found in a trashed magazine and cut into a strip and twirled individually, after which each roll is crafted to created a structure. It was my first time working with paper. I think paper is very tactile, I'm very curious as to the uses of paper, it's so multidimensional an object, that it fascinates me. I tried a lot of other materials before I got to paper, but I think I resonated the most with paper for this project. I tried working with all kinds of things from wood to stone. Every material has its limitations. What is the process of set building like? Deciding what I want to construct is potentially my largest challenge because a lot of it comes from my personal experience and from memory. Designing the vantage point is also really important because there’s only one view of the space. That comes from how I look at a particular thing, and it says a lot about that space. My second biggest challenge is being able to find all the colours because I don't paint or print anything. I create palettes and then after that I start constructing. So you’re certain about the palettes you want to use? Yes and no because a lot of times I'd like try to work with a certain palette but for some reason that colour is not available. Or I'll just put that on hold and move on to the next thing. The process is very symbiotic, it's not necessarily upto me. I have a lot of limitations given the way I work. I'm always changing, reinventing, you know, replanning things. There’s a certain quietness to your work even though these are public spaces. What draws you to these subjects in particular? I'm very curious about how individuals behave in a public space. You know you're in a public space, so you're very conscious about the way you behave. But they're all public spaces where you are alone. It's not like I've constructed a park where you can hang out with your friends. If you go to a toilet, you're usually alone. Or if you go to a bookstore, the purpose is to go buy a book. It's a private experience in a public space. It's not really like a bar or restaurant where it's a group event. The architectural subjects represented by my photographs are sites where public and private moments often uncannily coexist. Thanks for your time Dia. Find more of her work here and follow her on instagram at @diabhupal.